Influenza (or flu) is a serious illness. A 'common cold' is often called the 'flu', but they are different. Flu symptoms usually start suddenly with a high fever and you may feel sick enough to go to bed. Symptoms can also include irritation in the throat or lungs, a dry cough, shivering, sweating and severe muscle aches. The flu tends to make the whole body ache, whereas the common cold usually affects the nose and throat only. Influenza is an illness that usually starts quite suddenly, about 1 to 3 days after a person is in contact with someone who has the infections. 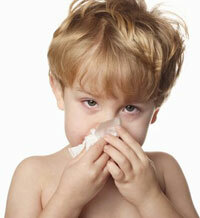 Children and adults with the flu often feel very unwell and develop a fever, headache, body aches and loss of appetite. They have a runny nose, cough and chills and feel very cold and shivery and may have a high temperature. The viruses causing flu often change a little, so that people who have had the flu before many not be protected by their immune system and can get the flu again. Some serious diseases may initially appear like a cold or flu but may require urgent medical attention. The best thing to do is to see your doctor if the symptoms come on suddenly, are severe or last longer than usual. At this point it may be a good time to ensure your child's immunisations are up to date. Your doctor can check the severity of the illness, tell you how long it may last, give advice on treatment and provide a medical certificate for work, school, university or exams if needed. Influenza vaccine is recommended in Autumn for people who are at risk of serious complications. Influenza vaccination will not prevent you from getting common colds as they are different viruses.